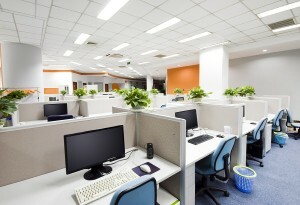 In any office, cubicles generally are the principal type of furniture. Cubicles with high panels enhance the privacy of employees, as opposed to cubicles with low panels that stimulate collaboration. Cubicles can also be configured to keep teams together. No matter the design or configuration, businesses from all over the country turn to Reimagine Office Furnishings (ROF) to provide them with attractive and affordable office cubicles. Buying used or refurbished/remanufactured cubicles allows customers to save up to 80 percent off the original manufacturer’s price. And, since we exclusively supply our customers with furniture from leading manufacturers, you never have to worry that quality will be sacrificed for affordability. If your business is in the Tampa, Florida, area, we welcome you to stop by our 140,000-square-foot facility to see our large selection of inventory. However, if you’re not located in the area – that’s no problem at all. Our close proximity to a major seaport and international airport allows us to ship our furniture nationwide both quickly and cost-effectively. For more information on our office cubicles, contact Reimagine Office Furnishings today. We will gladly answer any questions you may have.